JONATHAN FERRARA GALLERY is pleased to participate in PULSE Los Angeles Art Fair featuring represented artists David Buckingham, Gina Phillips, and Dan Tague. Los Angeles based artist DAVID BUCKINGHAM scours the High California Desert for old cars, hay balers and school buses that he cuts up to “liberate” the metal. Utilizing the original materials and color, he comments on mass culture. Buckingham’s 20 years as a professional writer and ad man inform his artwork. Movie Lines and their pervasiveness in our cultural discourse, Cartoon sound effects, oversized guns of the famous and infamous, text lines and famous sayings are created from the man-made detritus of a desert landscape. LA art critic Peter Frank wrote “What we say - and how we say it - to one another may seem like so much smoke signaling; but Buckingham thinks that our language, even at its roughest, has a monumental quality to it, and brings out that quality in a manner at once as modern as the words and as timeless as the impulse to speech itself." Buckingham’s work is several prominent collections including: Steven Bochco, Josh Groban, Gwen Stefani, Seth Rogen, Perez Hilton, Prada/Milan and the Cisneros Foundation. 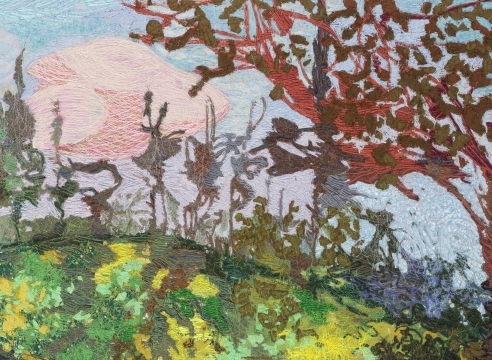 Phillips’ work has been exhibited in galleries and museums across the country and her work is in numerous collections including University of Kentucky, Lexington, NASA, New Orleans Museum of Art, Ogden Museum of Southern Art, Frederick R. Weisman Art Foundation, Tulane University and House of Blues (various locations across US.) She is a featured artist in Prospect.2 Biennial. Multi-media artist DAN TAGUE uses the appeal and power of money as the central concerns of his politically-charged Dollar Bill series. He is well-known for these works that are a hybrid of sculpture, photography and political statements. Tague often addresses the issues of our day by rendering visual equivalents by the most powerful means necessary. Installations, photography and artistic activism are his means of confronting and responding to the concerns of today’s world. His work has been exhibited at LMCC, Bronx River Arts Center and The Soap Factory in Minneapolis; Weisman Museum of Art at Pepperdine, Ballroom Marfa and VOLTA NY and PULSE Miami. Tague’s work is in the collections of The Whitney Museum of Art, New Orleans Museum of Art, Beth Rudin DeWoody, Dan Cameron, and The Frederick R. Weisman Art Foundation and The Louisiana State Museum. JONATHAN FERRARA GALLERY is a collective environment of creative visions: a commercial gallery with a public conscience. Artist, activist, and entrepreneur Jonathan Ferrara opened the gallery in 1998 to give artists a greater voice. Since its inception, the gallery has focused on cutting edge works by local, national and international artists with a sense of purpose, mission, and message. . The gallery produces monthly exhibitions and does art fairs including PULSE in Miami and LA and Volta in NY. The exhibition will be on view from September 30th through October 3rd at Pulse Los Angeles/ The Event Deck at L.A. Live/ 1005 West Chick Hearn Court/ Los Angeles, booth A-19.